Born in 1936 in Rushville, Nebraska, Donna was raised on a farm west of Gordon. She always loved horses and after high school, started barrel racing and roping. In 1965, she met Bob and a year later they married. They raised a daughter, Denell, and four sons, Stacy, Troy, Cory, and David Dunn. In addition, they have fifteen grandchildren and two great-grandchildren. In 1969, Bob and Donna moved their family to Rushville, NE, and bought a Coast to Coast store, which they later converted to a True Value store. They spent 30 years in the hardware business. In addition, they bought 115 acres just outside of town and built an indoor barn and outdoor arena, in which they hosted numerous rodeos and jackpots, including two NSPRA rodeos in 1985 and 1986. They also owned a 320 acre farm. In 1983, Bob and Donna purchased a building and started a church, The Christian Community Center. 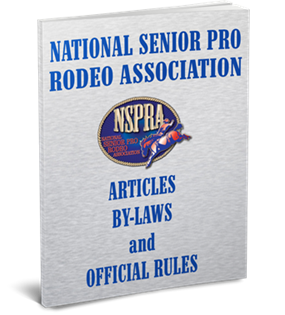 This led them to a new adventure in their lives – cowboy church services – which they organized at NSPRA rodeos for 14 years. Donna joined NSPRA, then known as NOTRA, in 1978. She and Bob began traveling extensively during the 90’s. After retiring from the hardware business and moving to Hermosa, SD in 2000, they began following the senior rodeos across the western United States and into Canada. 1993 and 1994 World Champion Ribbon Runner, 2003 Reserve Champion Ribbon Runner, 2002 and 2004 Reserve World Champion Barrel Racer, 2001, 2003 and 2005 World Champion All Around. 2004 Reserve World Champion All Around, 2006 Frontier Circuit Champion Barrel Racer and Champion Heeler in 2007, Canadian Reserve Champion Ribbon Runner in 2003 and Champion Ribbon Runner in 2004. Donna also served six years as Barrel Racing Director. Donna credits NSPRA with giving them the opportunity to make many friends and to travel to places that they never would have gone otherwise. She is most proud of winning the All Around title in 2005, the same year that Bob won his AA title.